The Hackaday Prize is back for the fourth year! Challenge yourself, make something amazing, change the world with your talent. This contest was created on 03/15/2017 and last updated a year ago. It&apos;s 2017. Our planet is facing issues like climate change, overpopulation, food shortage, technology security issues, and aging populations. We challenge you to come up with solutions to address current issues in the world today and create a better life for all of us. For the 4th year in a row, Hackaday Prize entrants will push the boundaries of problem solving to make a real difference in the world around us. In 2014 we launched The Hackaday Prize to our smart, talented, enthusiastic community of engineers, scientists, designers and creatives everywhere. Over 600 projects were created, and the winner, SatNOGS, now has a foundation where they are continuing the work they started here. In 2015 we challenged the Hackaday community to use their superpowers again. The results told the story of nearly 900 Hackaday Prize entrants using their unique skills to make big changes in peoples&apos; lives. 2015&apos;s Hackaday Prize winner, the Eyedrivomatic, directly impacted the lives of many with limited mobility. In 2016, we had nearly 1,100 entries, and the Hackaday Prize winner was Dtto, a search and rescue robot, an open source project that will continue to be worked on at the Supplyframe Design Lab. In 2017, We’re starting off with the Design Your Concept round, where you submit a simple idea and an image. After that, we give you 4 more Hackaday Prize challenges to run with. These 5 challenges run one after the other and each challenge lasts just 6 weeks. Alongside the other rounds, the Best Product round will be running. You can enter the Best Product additionally or separately with The Hackaday Prize. 20 projects will be chosen from each of the 6 rounds, and awarded $1,000 per project. That&apos;s $120,000 in prizes for semi-finalists! YES, that&apos;s $120,000 and super that so many builds get recognition and a piece of the loot. If you have more questions, please email us at prize@hackaday.com. We look forward to seeing your projects! There is a dropdown menu below your project image. Simply start a project and click the dropdown, from there you will see 2017 Hackaday Prize. What is considered an entry? Put simply, you need an idea, and image, and documentation. To start you simply talk about a technology problem facing people today and your idea of what a solution might be. Yes, you can enter the first challenge with just an idea and be eligible to be selected to move to the final round. This is what Challenge 1 is all about. Challenges 2 - 5 invite you to start building something and documenting. You need 4 project logs or instructions in Challenges 2 - 5 to move into the finals. Challenge five is for those who don&apos;t like to be tied down. Build anything you want to solve the problem you have chosen. Bask in your own creativity. Those who prefer more constraints will excel in Challenges 2, 3, and 4 which tackle specific themes. What are the 5 Challenges? When do they start/end? Each of the 5 Challenges are a 5-week first round from which 20 entries will advance to the final round. When are the winners for each round announced? Winners will be announced about 1-2 weeks after the close of each round. Can I enter if I&apos;m under 18 years old? Minors between 13 and 18 are eligible to enter the 2017 Hackaday Prize. When you enter as a team of collaborators, there is a link “younger than 18” next to the check box (see image below). When you click that link, it brings you to a parental consent form link (dropbox), which you should have a parent fill out and then upload using the “choose file” button below. I was a finalist in 2014, 2015 or 2016, can I enter the same project again? If you won anything in a previous presentation of The Hackaday Prize that project is not eligible for entry in this Contest. You may enter with a substantially different project. Can I re-enter my project from 2014, 2015 or 2016? You can enter a previous Prize entry, but you must create a new project page and the project must be significantly different from when previously entered and show meaningful development during the course of the Contest. How many Challenges do I need to participate in? You must participate in at least one challenge to be eligible for the final round. We encourage you to participate in more but it is not required. Is it possible to win more than one Challenge? Yes. The same Project Profile may be entered in any or all of the challenge rounds using the "Submit Project To..." menu found on your project page. Projects should adhere to the theme of the challenge so you may also consider entering several projects in different rounds. How do I see which projects have already been entered? Check out this full list of official entries. How much of my Project Profile will I be judged upon? All parts of your project will be judged. We recommend you start with a brief summary to provide an overall understanding of your project. From there, explain each part in detail, adding images and diagrams as needed. A video is only required for the final round, but if you want to make one to help walk through your project that is a great idea. Where do I submit my prize project entry video? On the Edit Project page add the link to your entry video in the Contest Entry Videos field and click save. What does "open" actually mean? For those who wonder how safe the air around them is and what can be changed to avoid the negative health effects of polluted air. Just out of curiosity. Did anybody actually won in two or more categories? I was hoping for a quick clarification. On the prize website calendar (https://hackaday.io/prize) when you hover over October 16th, It says "Anthing Goes projects selected, the top 100 finalist projects sent to the judges". However in the official rules page (https://hackaday.io/prize/rules-en) that the finalist have until 7AM PDT on 10/21 to enter the final details and submit the video. I assume that the official rules page is correct, but wanted to confirm. This page says "20 projects will be chosen from each of the 6 rounds, and awarded $1,000 per project." but the rules page says "up to one hundred twenty (120) submissions which advance to the final round will be awarded a cash prize of $1,000." Does this mean you have to enter the final round to be eligible for the $1000? Or not? Does the $1 per like apply to all rounds? Someone correct me if I am wrong but I think the $1 per Like was only the first round and was intended as project seed money. @Rupert Young - No it doesn&apos;t. It applies only to the first round. Does the project need to be complete before it is submitted? there is a delay on views for some reason, has been for as long as i have been here. They will show up eventually. Hi Alpha, and views start showing up after 50 counts. OMG , i get less than 50 in my project so sad xD . Anything goes will be up at 7am PDT. I just added my video at the appropriate place and clicked "Publish," but I don&apos;t see it anywhere once I&apos;ve published it. (The link is still there.) I just pasted the link, not embedded. Is this how it&apos;s supposed to be? You cant upload videos directly to Hackaday from your computer, only images and GIF animations. To post a video you need to upload it to somewhere like YouTube and then link to it. By far the easiest way to do that is to right-click the playing video and choose either the embed code or URL options from the menu, then use the Paste function to place the copied code into your project. @Joan Horvath the video submission field on the edit project page is not displayed publicly. You can confirm it was submitted by clicking on edit project again and reviewing the field entry. @Kristjan Berce We will be sending emails to the seed funding people very soon. Payment should be expected by end of may - June 12. Thanks for your patience! We have lots of people to pay. When/where will they announce the first 20 quarterfinalist? Are their any restrictions on later commercialization of entries? I.e. if i do not win anything here, do i still have the ability to sell my idea to someone else? You are still the owner of the project so I think it&apos;s fine. However, you can&apos;t sell an idea because there is no protection over such an impalpable and fuzzy ... thing. I advise you to better understand what "Intellectual Property" is, means, and how it works. Also the project needs to be some what open source for the contest, so kind of get in the way of *just* selling the idea. Patents are void by the disclosure/publishing. You&apos;ll need to consider the licensing and think of alternate way of monetizing. I don&apos;t know anything about other countries, but in USA, I believe you have a year from the time you make an idea public in order to file a patent. However, America, as I understand it is a first to file nation, and if you make an idea public, and someone else files before you do, you are out of luck. Whats the exact time for the may 1st deadline please? Hello @haydn jones! The deadline for the first round is May 1st 7am PDT. Good luck! thanks, will you snapshot for judging at that point? hey when are we getting the seed funding? Just noticed the amount of likes that I have on the leaderboard do not match the amount of likes I have on my project. I am guessing this is a programing bug that happened when the fund dropped to $0? Any thoughts? Seeing some interesting pattern of new user names that are clustered in a row in the feed. They starts out with something with similar patterns, but eventually turned to randomly mushed profiles. This started last 2-3 hours. I haven&apos;t looked really hard, but I see patterns. "The Contest is not open to residents of Quebec"
Can anybody explain why Québec is singled out ? A quick question regarding seed funding: last year the rules read "At least twenty entries with the most likes at the end of the first round will split $4,000", whereas this year the rules read "up to twenty (20) Community Vote winners will be selected to win a cash prize of up to $200". The change from "at least" to "up to" implies that this year not everyone will receive the seed funding. Is this correct? I didn&apos;t spot this. Where is it ? This year&apos;s Rule 9, under the "Community Vote Prize" section states "up to.."
Ohhh I see... I hadn&apos;t seen this document yet, thanks ! that Challenge Round (i.e., 7:00 am P.D.T. on May 1, 2017). II The selected winners will receive $1 for each “like” on their Project Profile, up to a limit of $200. Hi Alex, yes, this is correct. We will provide seed funding to all qualified entries so it is highly likely that most people will receive it. Hello - I noticed that all of the links I have shared on Facebook seem to be referencing a "cached" version of my Hackaday project. Almost like the server is keeping duplicate copies of the page, and creating unique links for each copy. The big problem is that it wont let people click the like button, or login from the page it opens. FYI - Im using the facebook app on a Samsung S7 edge, but I dont think that matters so much. Can you provide a link to the project you reference and exact steps to reproduce? 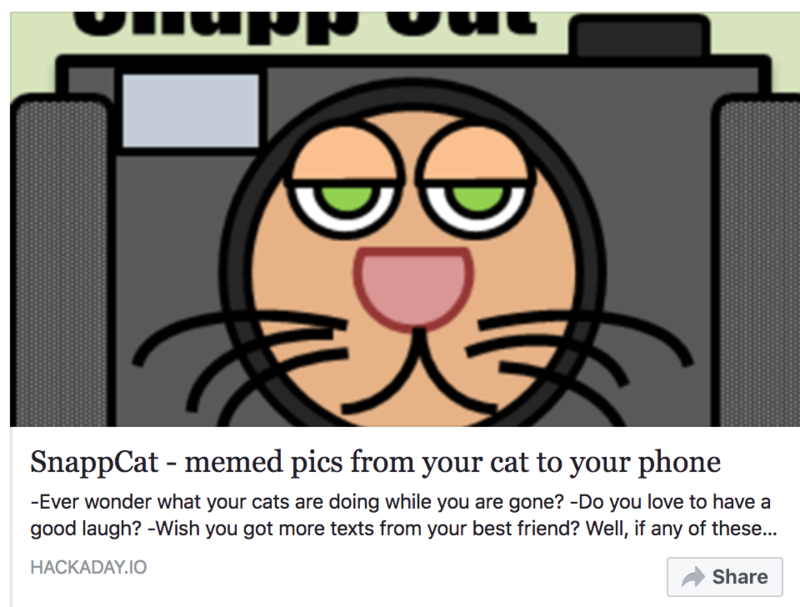 I have posted your project https://hackaday.io/project/20630-snappcat-memed-pics-from-your-cat-to-your-phone to FB from the Hackaday account. I have clicked on the link from FB and was able to like your project. Sophi, I sent you a private message with some screenshots. Thanks Richard! That would make sense. I also noticed it seems to only be an issue on the mobile app. At the top of the leader board there are some projects that just shot up with a lot of repeated names in the likes with no profile pics, and the appear to be connected. Thanks Haydn! We&apos;ll check it out. Hayden, not sure who you are talking about. However, in my personal situation my family and friends didn&apos;t have Hackaday accounts, but they still wanted to support the team and like the idea. So they were amazing enough people to actually make accounts and click the like button :). Best of luck to you bud! some have recently appeared and shot to >60 likes in a few days ? Yann.. Gotcha! Guess I hadn&apos;t really been paying that close of attention. :) Thanks! We have checked out all the recent projects. It is within the rules (this year, anyway ;) to have multiple people from one IP address like a project. Projects will be disqualified that have a script liking the project. I agree that having likes from compete strangers without profiles cheapens the likes. Suggestions for how to do this better next year are appreciated! Actually not complaining about stranger part - they carry much more weight in my book as they do not have the social circle/connection obligations. Sort of like you feel the love more from a cat that choose to like you over a dog that follow you regardless. Likes from people with projects also means a lot to me as they would appreciate the efforts even though some time it might not be apparent from the results and even more so from competitors for the funding pool. May be a one vote per IP rule? I kind of cheapen the "likes" if they are not because of merits and from complete strangers. Alot of our likes are people from our workplace, who were following our project before we posted on hackaday. Im assuming they would all have the same IP if they are clicking like from work? Unless they are at work 24/7 and no home with internet to return to. You know mobile have internet access these days. More a peer pressure to vote than total strangles with no connections that vote because of merit.. It becomes a race of who have the largest connections outside of HaD (i.e. families, class, work, clan, village, twitter/reddit/FB/youtube followers) than the actual technical content/creativity etc. i.e. *cheapen* the vote because of herding mentality. May be they have more courage to resist peer pressure, know that they are not qualified to judge from merits and should be commended for abstaining from likes. It is not a cookies/candy sale at work/church to support the local junior hockey team. When is the money from seed funding delivered? Just curious because it will help to buy the hardware I need. Hi Kristjan! Around the end of May 2017. You are about to report the project "The 2017 Hackaday Prize", please tell us the reason.